Welcome back to our series on why Quantities Matter. Before we dive into Part 4, lets briefly recap how we got here. Now, I’d like to walk you through Reason #4 which is proactive product management. At Creative Materials, we take a consultative approach to meet the customized needs of our clients on every level. Success in supplying material, requires proactive management with all parties to ensure project success. And to get there, to truly deliver our value, knowing quantities early on allows our team to do what we do best and effectively supply a consistent product. Why would it be beneficial for our team to know these quantities and details up front? Because, if aesthetic consistencies such as shade and caliber are going to be met, our team must proactively reach out to our manufacturers and partners and start the coordination efforts. This is something our project management team does in collaboration with the tile sub, manufacturer, and design team as soon as the project is awarded, and sometimes even sooner. In addition, special pieces such as cove base, inside and outside corners, bullnoses, and other trim details must all be considered. If the field tile has a unique glaze or graphic, the trim most likely will need to match the aesthetic qualities. 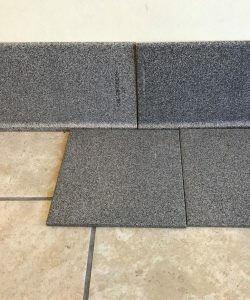 For larger quantity projects that will require special production of field tile, the coordinating trim will most likely need to be specially produced. Knowing quantities and details up front allows the Creative Materials project management team to consider all components and manage the project timeline for consistency on all levels – size, thickness, shade, caliber and overall aesthetic. Consider the image below. The design team on this project communicated quantities and aesthetic details from the start, so the Creative Materials project management team knew what the expectations were for the cove base. The team rejected the cove base shown on the right and approved the cove base on the left. It took 4 rounds to get it right, so knowing quantities required, and details up front allowed for enough time to get it right. Both cove base options shown below were rejected. A match was ultimately approved on round 5. The Creative Materials project management team handled all of the back and forth to get it exactly right for our client. 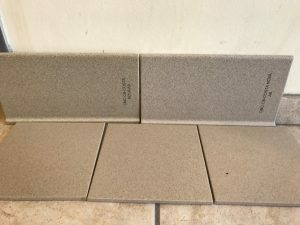 In the installation image shown below, Creative Materials consulted with the manufacturer, and the design team to find the right shade of cove base that would match both the wall tile, and the floor tile. 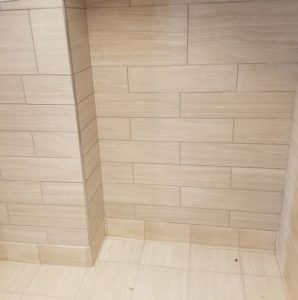 Since the ceiling light hits the cove base at a different angle from the floor tile, the project management team needed to find a cove base that had a lighter tone than the rest of the field tile. Consultation with the design team, manufacturer, and installer, and knowing quantities and project details up front, ultimately allowed our team to find an acceptable match. Tile flooring is known for its durability, stability, and ease of maintenance. That is why tile is so commonly specified in commercial applications. However, tile must also meet the design intent of the space in addition to meeting performance characteristics. No matter how beautiful the finished product is, the presence of inaccurate graphics, shading issues, or even sizing variances, will ultimately fall short of the original design intent. As a value-added supplier of tile for commercial spaces, we manage those details from specification all the way through installation. The more product and project details our team has, such as quantities, the more successfully we can manage your project. I hope you enjoyed our 4-part series on this topic of quantities. Join me next month as we will discuss tips/tricks to glass tile installation!